Magnesium has until now been mainly known as an essential mineral for nervous system balance, cardiovascular regulation, muscle function and bone health. Now it seems this mineral offers yet more benefits for human health - at least that’s what was suggested by the results of a meta-analysis published in the journal Current Pharmaceutical Design1. Researchers analysed a number of scientific studies on magnesium’s anti-inflammatory activity, opening up promising new prospects for the use of magnesium as a natural anti-inflammatory. Below is an update on their findings. While the benefits and therapeutic potential of magnesium have been recognised for many years, aspects of its mechanisms of action in the body remained unclear. Some in the scientific community were convinced of magnesium’s anti-inflammatory activity, others less so. 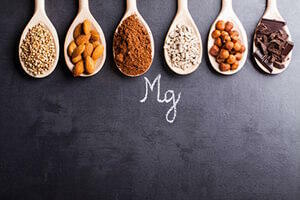 It was precisely to explore this question that these researchers set about collecting data from every study conducted on magnesium’s anti-inflammatory effects. They searched numerous scientific databases including PubMed-Medline, SCOPUS, Web of Science and Google Scholar. In this systematic review of the effects of taking oral magnesium, they used various methods to evaluate the relevance, accuracy and consistency of the data collected, enabling them to determine publication bias and sensitivity analysis. When these checks had been completed, a total of 11 studies were analysed for the effects of magnesium supplementation on plasma concentrations of C-reactive protein, a molecule produced by the liver and known to be involved in inflammatory processes. C-reactive protein is used by scientists as a biological marker: an increase in its concentration indicates an inflammatory response by the body. By cross-referencing the 11 studies selected, the researchers identified an association between magnesium supplementation and a significant decrease in plasma concentrations of C-reactive protein, an observation which supports the theory that magnesium does indeed have an anti-inflammatory effect. These positive results suggest that magnesium supplementation offers therapeutic potential for fighting inflammation and chronic inflammatory disease. While further studies are needed to confirm these findings, this meta-analysis opens up promising new prospects. Future studies on magnesium’s activity could see the development of a new and natural anti-inflammatory treatment. This meta-analysis has revitalised research into the therapeutic potential of magnesium. If its anti-inflammatory activity is confirmed by additional studies, magnesium could feature in the composition of new anti-inflammatory treatments. This meta-analysis also emphasises the importance of an adequate intake of this mineral. Frequently under-diagnosed, a lack of magnesium can manifest in symptoms such as loss of appetite, fatigue, muscular tension, and feelings of stress or palpitations. Nutritional supplements are often recommended for preventing or tackling these problems. Magnesium supplements are available in various forms such as magnesium malate. For optimal efficacy, no less than eight forms of magnesium are included in the formulation OptiMag from SuperSmart.